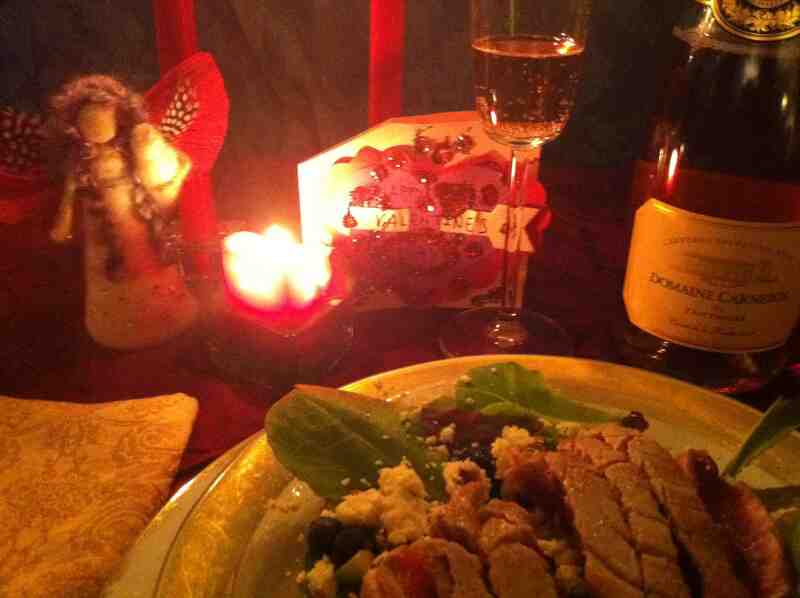 For Your Valentine Angel: Sparkling Rose + Seared Ahi Salad with Blueberries! What should you serve your Valentine? Something pink? Something sparkly? Something as delightful and surprising as your Valentine? 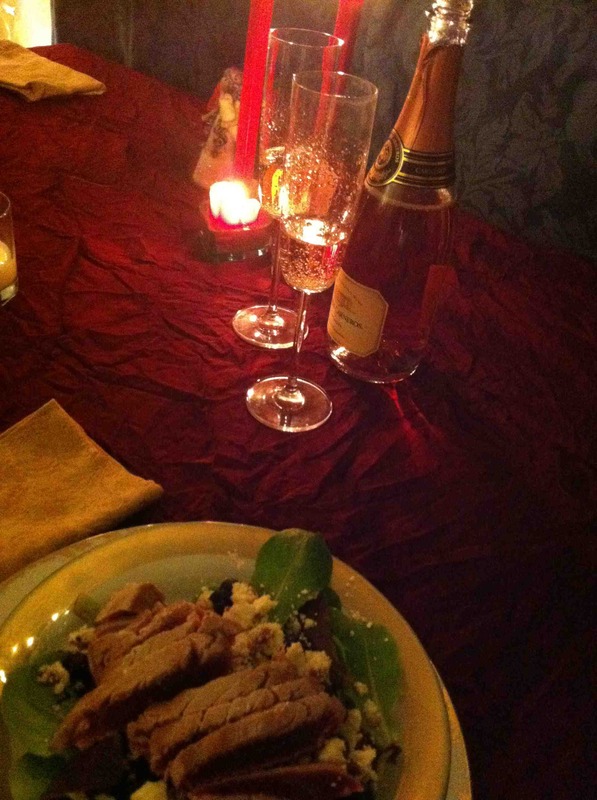 How about a light “pink” sparkling wine with ahi tuna, seared to keep it a pretty pink inside? Served on a bed of field greens with a white stilton with cranberries? And paired with a Domaine Carneros by Taittinger Brut Rose Cuvee de la Pompadour? Made in the traditional methods? And retailing at $35? Take it from me, this meal of seared ahi and sparkling rose is a winner! We’re fortunate here in Ventura to have a tuna boat come to our harbor about once a month from December through April or so. When it shows up, we go in with friends on a whole tuna and come home with bags of sushi grade meat that can’t really be any fresher. Keeping it on ice in the refrigerator, we usually eat one bag over two or three meals and freeze the second bag. We’ve served it different ways, but the best, and not to mention I think the most romantic, is seared for 30 seconds or so on a super hot skillet, then sliced and placed on a bed of fresh field greens. I add walnuts and blueberries and a cheese like feta or cotswald; since I discovered white stilton with cranberries, I’m convinced it’s perfect. 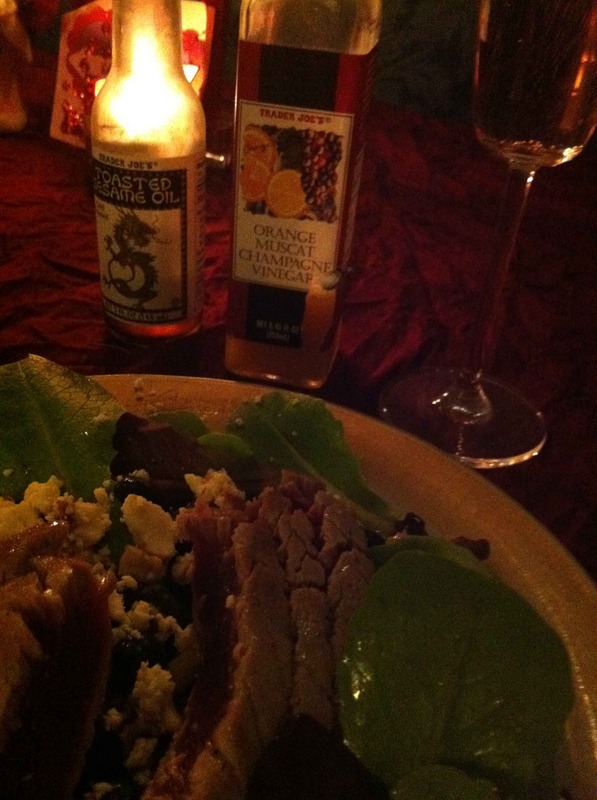 For a dressing, I like a champagne muscat citrus vinegar with walnut oil or sesame oil. You can also use rice vinegar and and oil. My husband has wasabi and rice vinegar on the side for the occasional tuna dip. There are more elaborate dressings, but for this meal, I keep it simple. I usually make rice for the side which you can serve with soy sauce or stir fry in some vegies, but the tuna with the greens is so good, I just have seconds of that! A blend of nearly 60% pinot noir with the rest chardonnay, the pinot noir grape skins stay in contact with the juice for several days to create the super pretty light pink color as well as more floral characteristics in the nose and more fruit flavor. If the color is too light, the winemaker might had in pinot noir. While pretty and pink, this is not a sweet wine at all, but a true Brut. I picked up mostly wild strawberries (have you ever tasted wild strawberries? They are very different than strawberry flavoring–too sweet– or grocery store strawberries–too bland!). With great minerality, it went well with a meal like we had or with lighter fare. It’s low alcohol (12%) means you could serve it on Valentine’s Day–Monday February 14–and still be good to go –and good to go to work in the morning! Maybe what I liked most is what sparkling wine does best: have bubbles! And these bubbles were so remarkably light and delicate, they felt like seafoam in my mouth! Truly a delightful experience! 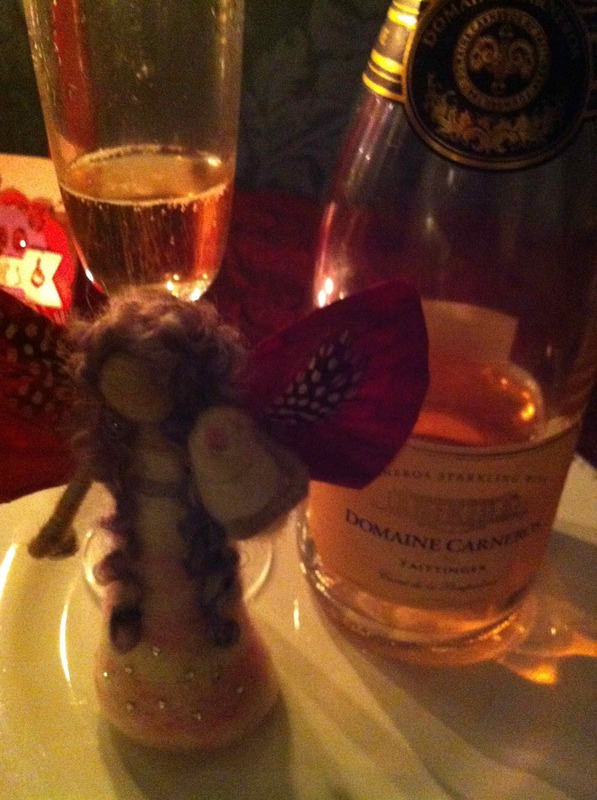 I admit I’m not usually big on rose but I like it with bubbles–and we both really enjoyed this one! Thank you to Domaine Carneros for sharing this sample with us which, along with the tuna boat, inspired us to prepare this amazing meal and to have a lovely romantic evening at home! More Valentine’s day tips to come! To green your Valentine with wine and handmade chocolate strawberries, check out this post. PS The beautiful Valentine Angel is handmade by Borbala Arvai at BoriDolls; the sparkly Valentine card was made by my son last year. 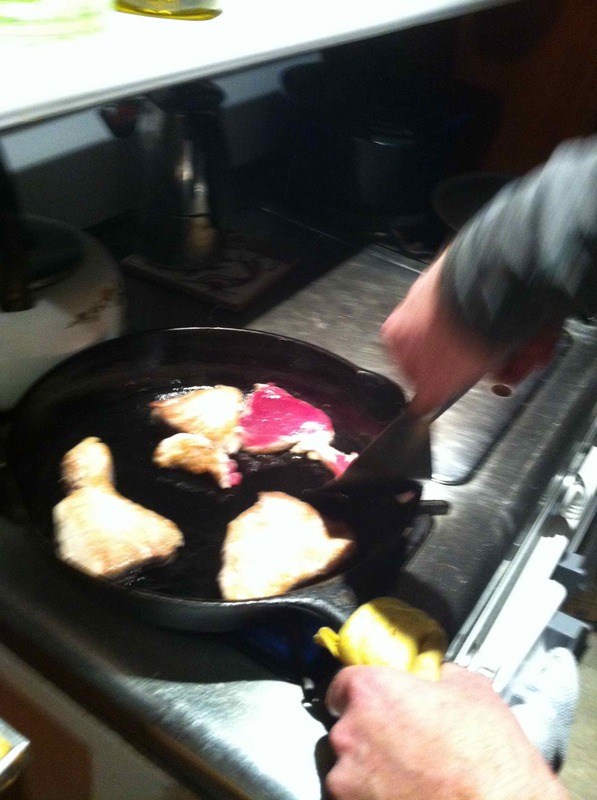 And that’s my husband searing the tuna! Photos taken with my handy iPhone. ← Adventures in Wine Coming Up: Egypt, France, Portugal, Spain–and SoCal too!